BALTIMORE, Jan. 18, 2019 /PRNewswire/ -- The 2019 Urology Residency Match results released today by the Society of Academic Urologists (SAU) and the American Urological Association (AUA) show a record-high 83 percent of women participating in the process have matched to urology residency positions. 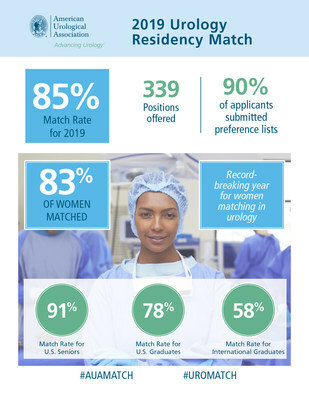 This strong presence of females applying for and matching with urology programs is an increase from the 75 percent matched in 2018. More than 430 aspiring urologists registered for the SAU/AUA Urology Residency Match. Of those who registered, 90 percent submitted preference lists, competing for a record 339 available positions across the country. When the matching algorithm was processed, 85 percent – the highest rate in nearly a decade - matched to a vacancy within 136 registered and accredited training programs in the United States, leaving just nine vacancies unmatched. "We are extremely proud of the success of the Urology Residency Match and welcome the continued growth in program participation and applicants," said SAU Past President, Byron D. Joyner, MD. "In the past five years alone, we have seen an increase of nearly 20 percent in the number of urology positions offered and a rise in the match rates for nearly every applicant group." Urology Match Day is an annual rite of passage for U.S. medical students and other applicants from around the world, a day set aside to recognize many years of hard work and dedication. Applicants received their "Match" offers earlier today, which allowed family, friends and mentors the opportunity to share in the excitement of learning which U.S. urology residency program these talented young physicians will attend over the next five years. "Today we congratulate applicants and programs alike," said AUA President, Robert C. Flanigan, MD. "We are honored to play a small role each year in moving forward the careers of these young physicians and wish each of the talented men and women nothing but success as they begin their journey toward becoming urologists." Medical students begin their residency application process at the start of their final year in medical school. After applying to various registered programs across the country, select candidates are invited by programs for interviews, which are held in the fall and early winter. Once the interview period is over, both registered parties submit their preference lists to the AUA, which has performed the Match annually on behalf of the SAU for 35 years. Results of the Urology Residency Match are closely watched as they can be predictors of future trends in physician workforce shortages and supply. The AUA uses a computerized mathematical algorithm to match applicants with programs using the preferences expressed on their ranked lists. About the American Urological Association: Founded in 1902 and headquartered near Baltimore, Maryland, the American Urological Association is a leading advocate for the specialty of urology, and has more than 21,000 members throughout the world. The AUA is a premier urologic association, providing invaluable support to the urologic community as it pursues its mission of fostering the highest standards of urologic care through education, research and the formulation of health policy. About the Society of Academic Urologists: Formed in 2016 when the Society of University Urologists and the Society of Urology Chairpersons and Program Directors merged, the Society of Academic Urologists (SAU), provides academic urologists with a forum to discuss, review and work toward resolving critical issues in all aspects of academic urology. Additionally, SAU maximizes benefits for educational urology programs, streamlines communications with the AUA, RRC, ABU, and other societies, as well as gives academic urology a voice in the AUA Match program. © 2017 American Urological Association.| All Rights Reserved.